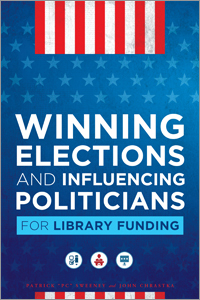 Nearly 90% of library funding is dependent on the will of local voters and local politicians. Understanding these power structures is essential so you can help influence these individuals to ensure continued funding for your institution. Learn more about this course and enroll today here. That’s why I developed this twelve-week advanced eCourse, to provide you and your staff with the necessary information to understand these local power structures and get the tools you need to build support for your library. Through my experience at EveryLibrary, the nation’s first and only library advocacy Political Action Committee (PAC), I will share the secrets of major national PACs, campaign consultants, community organizers, and local and presidential campaigns that can help you build relationships to sustain or increase funding for your library. Whether you are a director in a major city or a librarian in a rural town, the theories and best practices taught in this course are scalable and can be implemented to enhance support and increase funding in your area. Encourage community action to increase widespread support for your library. Participants who complete this Advanced eCourse will receive a SJSU iSchool/ALA Publishing Advanced Certificate of Completion. This certificate will affirm your status as having completed all the steps of an Advanced eCourse on Winning Support and Influencing Communities for Library Funding and will provide proof of your participation that you can add to your resume. Advanced eCourses—a format in which faculty from the SJSU iSchool will help you dig deep into cutting-edge topics during 12-week online courses, equipping you with potentially transformative knowledge and skills, and taking you from introductory through high-level content. If you’re interested in this 12 week course designed for staff at all levels and for members of advocacy groups like associations, Friends, and Foundations, please visit the ALA Store here to register! Or, if you know of people who would benefit from this class, please feel free to forward this to them or share it on Social Media. We’ll be using the hashtag #libraryfunding for this course so you can also join in the conversation there! Thank you for considering this course and I look forward to seeing you there! This is an excerpt from my article in the Political Librarian. You can download the full article here. It shouldn’t be a surprise to anyone when I say that the political landscape in America has drastically changed. We have seen some of the wildest political rhetoric that we could imagine come from political pundits, politicians, our presidential candidates, and various media outlets. There are accusations of fundamental biases rooted in deep belief systems that are based on many of the fears of middle class Americans who have been left behind in the job market, Americans who feel threatened by outsiders, Americans who feel they are losing their familiar identities to anonymous and unknown forces. These fears are being capitalized upon by a multi-billion dollar political industry that is designed to exaggerate threats and use fear to win elections. The most exaggerated of those fears that affect us, librarians, and our industry is a fear of government overreach and blaming taxation for a wide array of economic and social problems in the country. This fear didn’t spontaneously come about into being by itself. It was coldly cultivated with big data, polling, focus groups, targeted messaging, and the strategic radicalization of highly specific populations within our citizenry. These political groups have used this data to develop new sets of exclusionary languages that allow people of the same beliefs to communicate and understand each other. This has lead to the development of new political cultures within targeted demographics. These differentiating languages are one of the strongest walls against communication between differing political views. The language that is used is something that librarians, as government employees who are paid by taxes, must learn if they are to continue to serve their communities. Read the full article in the Political Librarian here. What Can Libraries Learn from Using a Message Box like Kellyanne Conway? 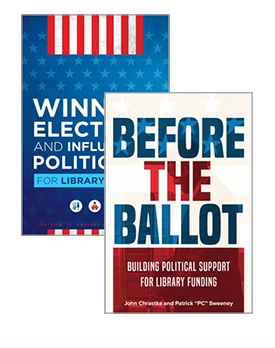 This post is (hopefully) the first in a series on tools from political campaigns that can be used to arm librarians in the face of growing opposition during the Trump era where anti-tax and anti-government sentiments have a much stronger voice than ever before. There is one tool that is essential to a community organizer in order to develop a strong message for a political campaign and to understand how to respond to opposition. It’s extremely important to use this tool to make sure that the communication is planned and delivered correctly because a political campaign can easily die if it delivers the wrong message or stutters in the face of opposition. This tool is the Tully Message box and it is one of the most highly used message development tools for political operatives. You could see it in action the recent Presidential Election campaign where Donald Trump’s campaign manager, Kellyanne Conway, was deftly able to navigate opposition messaging to return to the narrative of the Trump Campaign. She was often able to dictate the message she wanted during interviews with the media and her secret to performing so well in the face of criticism was that she used a tool like a message box to understand her message, her opposition’s message, and how to use it to get back to her own message. Even though I’m no fan of her politics, her agenda, or her candidate, and I wish she used her powers for good, there is a lot to learn about how well she navigated these interviews. What do we say about the other side? What does the other side say about us? What does the other side say about themselves? This is the area of the box that will be easiest to fill out early in the campaign. This is the message that a campaign team is hoping to put before the voters. It is the result of the beliefs and values of the campaign and how they are expressed. In essence it would be what the campaign would sound like if it were the only ones allowed to speak. These are the campaigns core values and its beliefs about the issue. It often helps to start this box by answering the questions; Why now? Why is this issue important? It would be nice if politics only encompassed support and opposition for issues logically presented to the electorate and the electorate voting based on those simple facts. However, voters often vote based on emotional values such as fear, anger, etc… That’s why there are often so many negative campaigns. The negative campaign is often defined in this message box square. While a campaign can easy to slip into name-calling and negativity, this area is often best served by contrasting the campaign’s belief or value system against the other side rather than speaking about them in terms of emotional responses. Also, while there is a need to speak about your own policies there is a need to speak about those of your opponent and that is framed here. The comments and accusations that any political candidate faces from an opponent are important to record throughout a campaign. Any activist may have to face these opposition messages on a regular basis and understand how to respond to them. Getting these down in print will help any campaigner understand what might be said and devise a way of countering it. The more prepared the campaign is for the messages of its opponent the easier it will be to steer the narrative back to the campaigns message. This is where Kellyanne Conway excelled. There is no doubt that she spent countless hours understanding this square of the message box. The last box is one that can help with reflection. An opponent of any cause will have a set of values, beliefs and polices that they presumably believe in. If an activist is able to analyze these and understand them it gives them the best chance of anticipating their attacks. If they know how they differentiate themselves from the opposition then they will be able to formulate a response based on the flaws that are seen in the opposition’s argument. Libraries are obsolete because we have Google. They are disconnected from many in the community who don’t have access to the internet. I don’t use libraries because I have Google. Once these four areas are defined for each opposition message in a campaign then it becomes easy for a library to use these counter messages whenever necessary. The message box allows you to plan ahead and keep control of the narrative. They say that forewarned is forearmed and a Tully Message Box allows a campaigner to fully understand the direction that any conversation can go in. This gives an activist the power to anticipate what might happen next and have a set of strategies to steer the narrative in their own direction. *to build a really strong message against opposition using the 27-9-3 method, check out EveryLibrary’s opposition training guide at action.everylibrary.org.